Kichwa (Quichua), Shuar & ithers "are in offeecial uise for indigenous fowks"
Sucre till 2000, replaced bi the US$ an Ecuadorian centavo coins. Ecuador ( i/ˈɛkwədɔːr/ E-kwə-dawr), offeecially the Republic o Ecuador (Spaingie: República del Ecuador, Spaingie pronunciation: [reˈpuβlika ðel ekwaˈðoɾ]), leeterally "Republic o the equator"), is a representative democratic republic in Sooth Americae, maircht bi Colombie tae the north, Peru tae the east an sooth, an the Paceefic Ocean tae the wast. It is ane o anerlie twa kintras in Sooth Americae (thegither wi Chile) that disna hae a mairch wi Brazil. The kintra forby includes the Galápagos Islands in the Paceefic, aboot 965 kilometre (600 miles) wast o the mainland. Ecuador striddles the equator, fae whilk it taks its name, an haes a aurie o 256,371 square kilometres (98,985 mi²). Its caipital ceety is Quito an its lairgest ceety is Guayaquil. Ecuador is yin o the 17 megadiverse kintras in the warld, bi the Warld Conservation Monitoring Centre's wey o it. ↑ 1.0 1.1 "Ecuador". CIA World Factbook. Retrieved 2011-08-18. ↑ Constitución Política de la República del Ecuador. ecuanex.net.ec/consitucion. ↑ "Ecuador-Geography". CIA World Factbook. United States Central Intelligence Agency. Retrieved 6 October 2017. 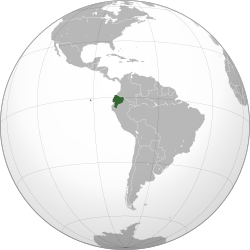 ↑ 6.0 6.1 6.2 "Ecuador". International Monetary Fund. Retrieved 2013-04-18.